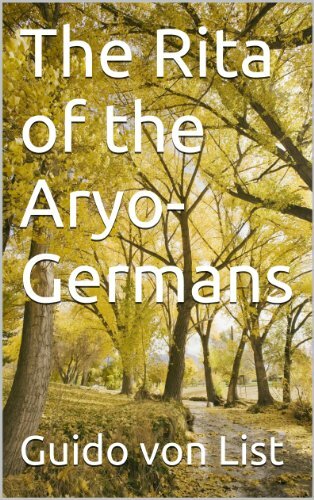 This is a translation of Guido von List’s book: Die Rita der Aryo-Germanen. Guido von List describes in this book the basic life philosophy of the pre-Christian Germanic people. He shows that the life was organized after divine principles which he explains in his first chapter, called Urda. Urda means the origin, first cause and von List follows the cosmic laws which led to the creation of the world we know. He identifies the principles used in the creation and how the heathen germans organized their life after these principles. In the second chapter, called Werdandi, he shows how heathen life developed with these principles and how the growth of the ‘way of life’ of heathens went. His studies encompass the rights (Rita means what is ‘right’) and laws to customs, to the Gods and their behavior. The ancient system of the Thing is explained and it comes back to life with his words. One finds the ideas of our far ancestors are still alive in modern times. Many aspects he shows, originating from our ancestors, are still in use today, albeit not with the right understanding. He showed how our understanding of ownership of land changed over the millennia, with examples from Gothic conquerors of Rome and their way to distribute the land, to old saxon laws, to the change which the roman law brought in this aspect and how it lead to land speculation, mortgages etc. Similar tracks are followed with criminal justice. In the beginning the judges (which he called Armanen) were only pointing the life (of the criminal) to be in line with divine law. Later on simple punishments were used until in the end we developed the modern way of justice. Also marriage laws are looked upon how they changed through the millennia, how they deteriorated until in modern times it came back to a more humane level. He also follows the ways of how ancient Germanic people governed themselves and organized themselves to the deterioration into Lordship and official bureaucratic government to a plain tyranny and the modern remedies to that. The freemasonry and the wisdom they preserved plays always a role in his books and so also in this. Many place names in Germanic lands are in reference to the sagas, the Edda and other traditions. He shows why it is this way and why it is that there are complete sets of names in certain areas which are then also found in other areas. In the chapter Schuld he shows through what our current system has to go through to come to a new beginning where the laws, customs, governing etc is again in line with divine law. Added to his book are a couple of chapters by his close followers, adding and deepening some subjects Guido von List touches. One is about the German Vehme. During the Christianization period the German law system clashed with the roman laws. Through the Catholic church roman law was promoted which was foreign to the understanding of Germans. The growing power of the Church eroded German law by giving indulgence letters to any criminal who could pay and then let them continue with their crimes. That led finally to anarchy in Germany. The old heathen judges formed an organization (the Vehme) which then spoke justice and was able to enforce their sentences. The justice was harsh but created a stable law in Germany. Over the centuries the struggle against the roman law continued. The laws in Germany are today a mix of both, german and roman law, thanks to the effort of this organization. It lasted until the early 1800’s, when the last Free Judge died and took all secrets with him into the grave. The other addition is about a small area in Thüringia (Thor’s or Tyr’s men) and the retraceable heathen history in a small patch of that state. The mixture between Celtic and Germanic life, religion and culture is made alive again. This book is one of the most important for people who are interested in heathenism and a must read.